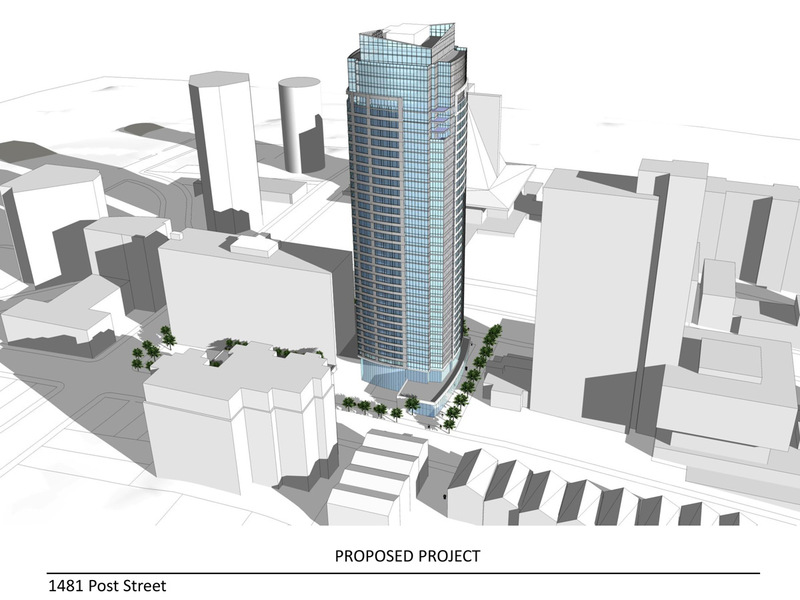 A rendering of ADCO’s proposed tower at 1481 Post Street. It may be a sleek luxury high-rise condominium bringing new life to Cathedral Hill. Or it may be a code-violating, too-tall tower adding traffic, wind, noise, parking and shadow nightmares — and opening the door for more spot zoning across the city. New York developer ADCO Group’s plan to build a 36-story residential tower at 1481 Post Street is drawing mounting concern and opposition from nearby residents. The project is expected to come before the Planning Commission in late September. 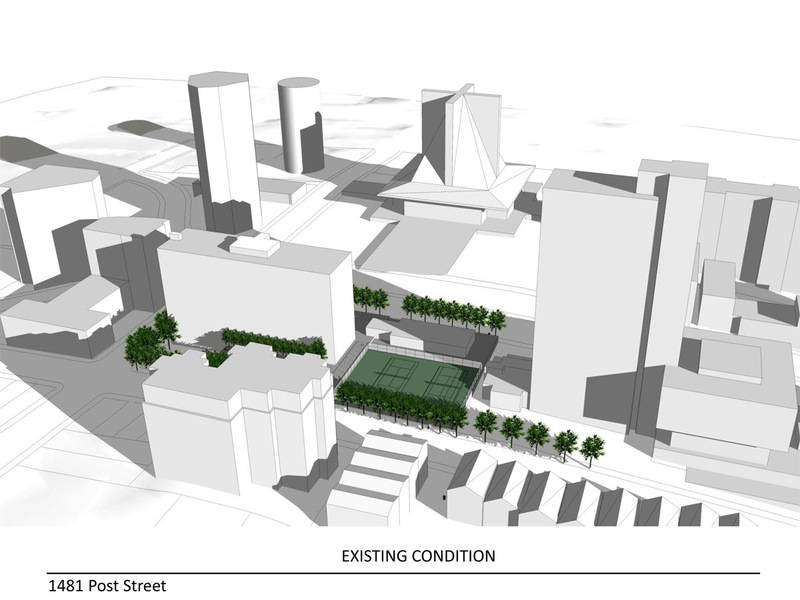 The building would replace an above-ground parking structure, fitness center and tennis courts that adjoin Cathedral Hill Plaza apartments at Post and Gough, which ADCO also owns and plans to remodel. The new tower would rise to 416 feet, requiring an exception to the 240-foot height limit the city planning code sets for the site. ADCO — a key player in the redevelopment of Cathedral Hill five decades ago — is promising its project will be beneficial to the neighborhood. “Benefits to the community will include significant streetscape improvements,” says ADCO’s Linda Corso. “What is now a blank wall on Geary will become a glass-front building with an expanded fitness center,” with a ground-level cafe and garden fronting 1481 Post and the apartments to the east. Adding pedestrian and residential activity and a mid-block crossing will enliven the area and increase safety, Corso maintains. Corso says ADCO will also make extensive improvements to Cathedral Hill Plaza, the adjacent 14-story apartment building. Most significant would be a redesign of the entry from the current portico on Gough to an open entryway on Post. But many neighbors aren’t buying it. An array of groups and individuals dubbed SOS Cathedral Hill, led by the Cathedral Hill Neighbors Association, opposes granting the exceptions required for both the height and bulk of the building. In addition to concerns about traffic and shadowing, opponents say the size of the building would create safety issues for the hundreds of seniors who live in the immediate area. “This proposed project would be out of scale and incompatible with the existing plan of our neighborhood,” says Marlayne Morgan, president of the Cathedral Hill association. The neighborhood plan in question grew out of the much-reviled redevelopment push in the 1960s that leveled Japantown and gutted the heart of the Western Addition. One early segment of the redevelopment area, centered around a new St. Mary’s Cathedral, became known as Cathedral Hill. Bordered roughly by Franklin, O’Farrell, Post and Octavia, Cathedral Hill was planned with residential buildings of varying heights up to 240 feet interspersed with open spaces — including the parking structure and tennis courts at 1481 Post. A restriction in the plan that prohibited building on the 1481 site expired after 40 years. New York developer Alvin Dworman, founder and chairman of ADCO, played a key role in redeveloping Cathedral Hill. In addition to Cathedral Hill Plaza apartments, he built the 240-foot residential tower at 1200 Gough Street, on the corner of Geary Boulevard, and helped the Catholic Church put together land for St. Mary’s Cathedral. He also developed the Normandy apartments south of St. Mary’s. ADCO’s promotional materials claim 1481 Post will be an especially important addition to the city’s housing stock because roughly half of its 262 units are “family-friendly,” with two bedrooms or more. To get the variances it needs to exceed the height and open space requirements of the site, ADCO is touting the community benefits it is offering in exchange for code exceptions. “We are talking with organizations like the Buchanan YMCA, Boys and Girls Club, and groups in Japantown,” Corso says, and conducting “listening sessions” to assess neighborhood needs. Opponents argue that community benefits are elusive and negligible, and do not offset the adverse impact of the luxury tower. It is the threat to the senior population that also concerns Carlisle resident Gabriel Gregoratos, a retired cardiologist. Gregoratos points out that the new California Pacific Medical Center will have entry and exit ramps for its emergency room two blocks away on Post Street. ADCO’s Corso notes that the draft environmental impact report for the project — not yet approved — says the impact on parking and traffic would be negligible. Cathedral Hill’s Morgan acknowledges changes in parking supply are not considered a significant environmental impact under current codes, but she says the impact will be real. Neighbors have hired architects, lawyers and consultants to try to mitigate the effects of the new tower, and have submitted alternative designs to the Planning Commission. The consensus favorite proposed by Northern California Presbyterian Homes and Services, parent organization of the Sequoias, is within the 240-foot height limit. 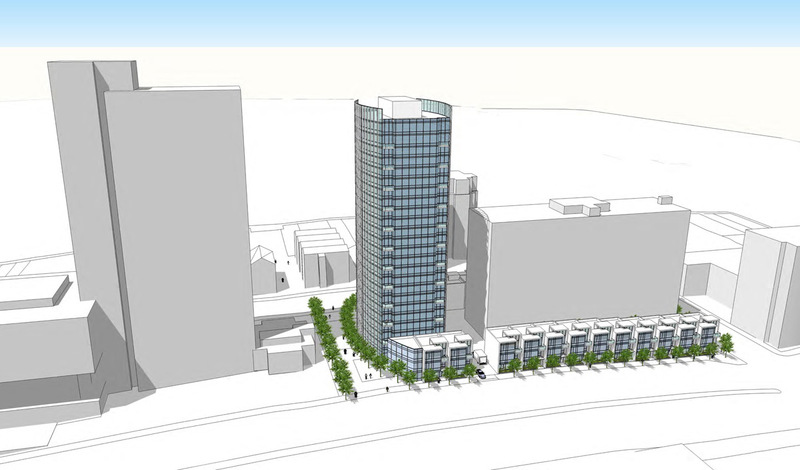 An alternative proposal would reduce the height of the tower and add townhouses. Corso says her company has no interest in a smaller building. Morgan notes that other developers have worked with community members to find acceptable compromises. There is a palpable sense of frustration on the part of SOS Cathedral Hill groups. “The developer’s unyielding position in the face of community opposition is impossible to understand in the current San Francisco environment of working with the community to reach accord,” Cheatham says. 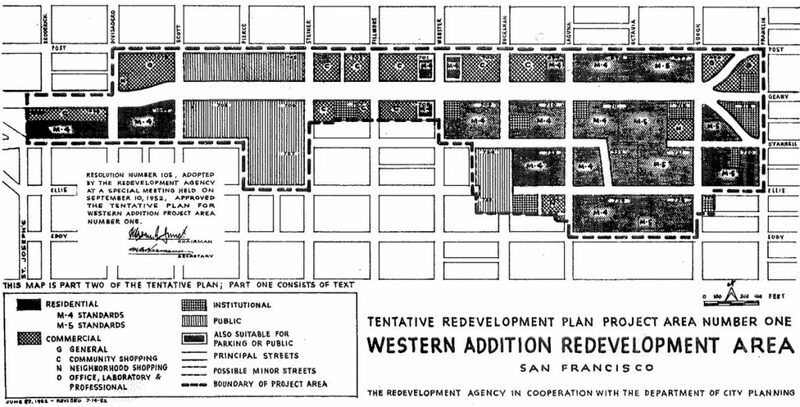 The much-reviled A-1 redevelopment plan from the 1960s. Behind the push-pull of residents and developer battling over the proposed luxury condo at 1481 Post are a million stories. On one side are the stories of how those residents came to live there and scars that remain from the redevelopment of the neighborhood. On the other is the story of one highly regarded, immensely successful New York developer at the center of it all half a century ago — and now in the spotlight again. Alvin Dworman, chairman, founder and singular force of ADCO Group, is the longtime central figure in the redevelopment of Cathedral Hill. Dworman was already well on his way toward the billions of dollars he would make for himself and his investors with varied developments across the U.S. when he first learned of San Francisco’s Western Addition Redevelopment A-1 project in 1960. But he made the trip, soon becoming what ADCO’s website describes as the Western Addition’s designated developer. Among the major parcels he acquired when the neighborhood was bulldozed was one key lot bordered by Post, Gough, Geary and Octavia. He put up a 14-story apartment building, Cathedral Hill Plaza, on the Gough Street end, with an adjoining above-ground parking structure topped by tennis courts on the western half. The western portion was protected from development for 40 years, designated as one of the open spaces planned into the new Cathedral Hill area. 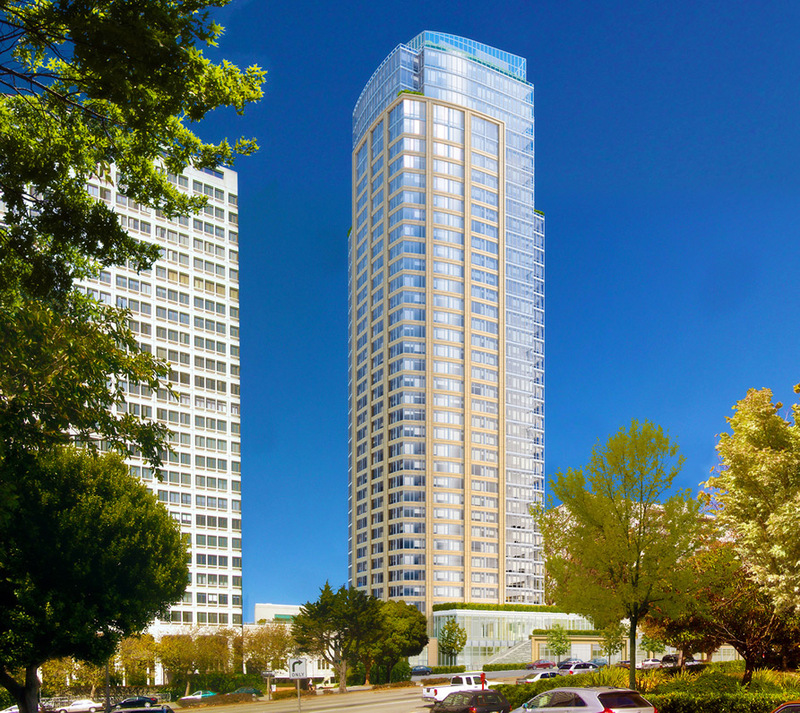 Now, 40 years after buying the property, Dworman is back with a proposal to build a 36-story luxury tower with 262 units offering multiple amenities and views. “Alvin doesn’t sell, he buys,” his friend former mayor Willie Brown told the Business Times. During the 40 years Dworman sat on the property, the community grew, and aged. Senior homes and assisted living facilities, mostly church-related, went up around Cathedral Hill — most significantly the Sequoias, which is adjacent to 1481 Post, with 300-plus apartments and a 50-bed skilled nursing section. There is also a 12-story retirement condominium, the Carlisle, directly across Post Street, plus multiple other senior residences within a few blocks. Nearby senior neighbors have become a vocal force in questioning why the city should allow Dworman to build a tower that so massively exceeds the area’s zoning. Alvin Dworman claims his new project will create 262 “environmentally conscious, transit oriented homes and a more active and vibrant pedestrian experience.” If he succeeds, it will confirm the reputation that brought him to the area more than 50 years ago.